On manufacturing, art, and travelling the globe! My name is Swetha Sriram and I’m a senior Industrial and Management Engineering Major from San Jose, California. Have you always wanted to be an engineer? What attracted you to Rensselaer? I think I have always wanted to be an engineer. When I was a child, I used to take all the pens in my house and disassemble them because I loved seeing how they worked and how all the pieces fit together. I also spent my high school years working on a FIRST Robotics team, machining and working on the mechanical team. I came to Rensselaer because of the facilities provided to students, such as the MILL and the HASS Automation Lab, which I’ve used extensively during my time here. Last year, the School of Engineering made a major milestone. We have more than 1000 women enrolled in our undergraduate engineering programs. What has been your experience been like? RPI Engineering has given me opportunity to learn from and work with experienced and well-qualified professors. It was a special honor for me to present at the 2017 National Manufacturing Day event and share my experiences with high school students. With regards to women in engineering, in addition to incoming students, I would also like to see more female professors in the engineering disciplines. When I’m not studying, I work as a student assistant in the Engineering Processes Lab. It allows me to share my passion for machining with other students and answer any questions they might have. I also spend some of my free time in the machine shop working on some of my personal projects. You are also an artist and you have done well in academics. What is your secret? What makes it special? I work on my art to relieve some of the stress and anxiety of being an engineering student. It gives me the opportunity to create abstract sculptures without needing to follow design constraints and engineering drawings. I also have restless hands and building my sculptures lets me work with my hands for hours at a time to create things with any materials I’m able to find. Tell us about the intersection of art and engineering. Does your creativity help you become a better engineer? What has been your favorite experience at Rensselaer? My favorite experience at Rensselaer has been the Manufacturing Processes and Systems Laboratory Course. We designed a bicycle bell and spent a semester developing the manufacturing processes to make it. The following semester we actually produced 400 bicycle bells in the MILL! It didn’t feel at all like a typical lecture course. It was real world manufacturing experience and we had the opportunity to work with incredible engineers to make our product a reality. My favorite thing to do in Troy is the Saturday morning Farmers Market. It’s a great way to socialize and connect with all kinds of people from the area and I love supporting local artists and farmers and trying new foods. Downtown Troy is also a beautiful place to walk around and take photos and it gives me a lot of inspiration for my own artwork! What do you want to do when you grow up! (I mean when you graduate)? After I graduate I hope to work with a manufacturing company, developing and improving manufacturing processes to make them more efficient and environmentally conscious. I want to make a significant impact in the manufacturing industry, be it improving an existing process or developing an entirely new one. What are some of your favorite books? TV shows? My favorite books are the Culper Ring novels by Brad Meltzer. I discovered these really fascinating and fast-paced adventure books recently. They are perfect to read in between classes or during any other free time I can find. I’m also re-watching the HBO show Newsroom. Is there anything we didn’t ask you about, but you want to share? My absolute favorite thing to do is traveling. I’ve been traveling since I was really young. My parents used to take my sister and me to at least one new country a year, and it’s exposed me to such a large array of cultures and foods. I loved the breads and cheeses in Switzerland, small towns tucked away in the country side of the Netherlands, and distinctly remember all the wildlife – playing with parrots and monkeys – in Costa Rica, when I was much younger! My goal is to travel to 100 countries by the time I’m 30 and I’m around a third of the way there! 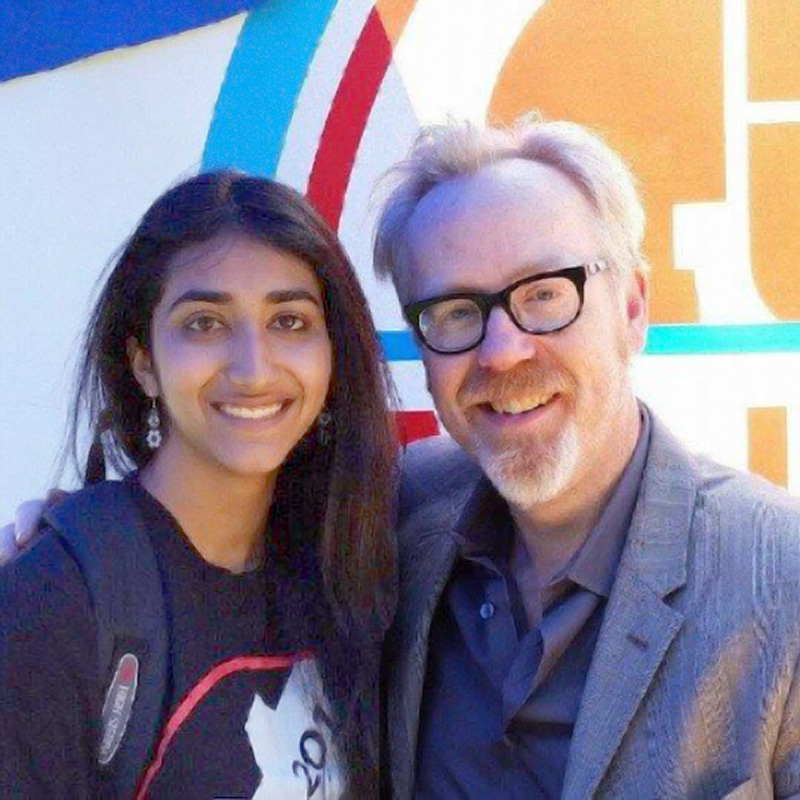 Another random fun fact, I was on an episode of the last season of the Discovery Channel’s series Mythbusters!